During the Marvel Digital: What’s Next panel, Marvel dropped the big one that I was half expecting to come about a month ago – it will release it’s major titles digitally on the same day the books arrive in stores. But unlike DC Comics who stunned the publishing world in June, Marvel won’t roll out all of the titles at once. 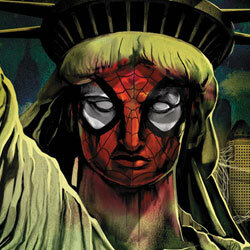 First out of the gate will be the Spider-Man titles beginning with Amazing Spider-Man #666 that arrives next week. X-Men titles will join the Spider-Man titles as the books released this year with Uncanny X-Men #1 and Wolverine & The X-Men #1 arriving at the end of November. “As we progress toward The Avengers movie, you’ll see more of the line going day and date,” said Gabriel. I don’t expect Marvel will drop the price of the digital books, but rather keep the same pricing method (full price first day, and dropping after a month or two) as the other publishers. Yeah! Good to see more move that way! I welcome it, my iPad welcomes it, and my wife welcomes it too (no more piles and piles of boxes)! Goooooooooo Marvel!